Pharmacologic treatment and lifestyle change may be required to reduce the risk of HF. Hypertension is recognized as a precursor to myocardial infarct and ventricular diastolic dysfunction, both of which are commonly found in HF patients. Hence hypertension and coronary artery disease are primary foci of HF risk prevention strategies. Diuretics may be ordered for early signs of hypertension. These medications act on the kidneys to increase the elimination of sodium and water thus reducing blood volume. The three types of diuretics are thiazide, loop and potassium-sparing. Triamterene (Dyrenium) (Mayo Clinic Staff, 2016). Each class of diuretic acts differently on the kidneys and vary in side effects. All diuretics result in increased urination and mineral loss. The thiazide diuretics can lead to low potassium levels and potassium-sparing diuretics can lead to high potassium levels. Low sodium blood levels (hyponatremia) side effects include dizziness, headaches, dehydration, muscle cramps, gout and impotence are also potential side effects (Mayo Clinic Staff, 2016). Low Potassium blood levels (hypokalemia) side effects include muscle weakness, fatigue, cramps, slowed reflexes and possible ECG changes. 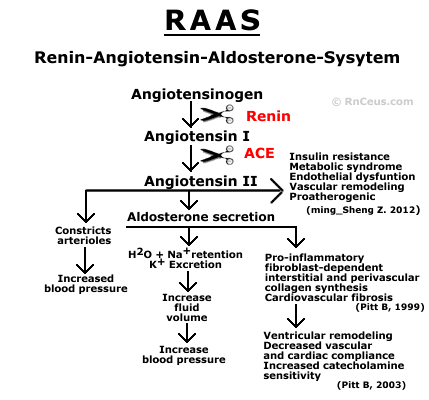 Angiotensin-converting enzyme is a catalytic enzyme in the Renin-Angiotensin-Aldosterone System (RAAS). The RAAS is a hormone system that is involved in the regulation of the plasma sodium concentration and systemic blood pressure. The plasma protein angiotensinogen is a prohormone produced by the the liver. Under conditions of decreased perfusion, the kidneys produce the catalytic enzyme renin which cleaves angiotensin I from circulating angiotensinogen. Angiotensin I circulates in the plasma to the lungs where the catalytic enzyme Angiotensin Converting Enzyme is highly expressed on the pulmonary capillary endothelium. Endothelium expressed ACE comes in contact with circulating angiotensin I and cleaves it to produce the angiotensin II peptide fragment. Angiotensin II is a powerful vasoconstrictor that increases blood pressure and also induces insulin resistance and endothelial dysfunction. Angiotensin II also stimulates the adrenal cortex to produce the hormone aldosterone. Aldosterone causes the distal tubule of the nephron to retain H2O and Na+ which increases the plasma volume, Na+ and blood pressure. Aldosterone has significant pathogenic hypertrophic effects on myocardium. ACE inhibitors competitively prevent the conversion of the inactive peptide angiotensin I to angiotensin II, the most potent vasoconstrictor known. Besides vasoconstriction Angiotensin II hormone causes the release of aldosterone from the adrenal glands. Aldosterone causes Na+ and water retention which further increases blood pressure. ACE inhibitors lower blood pressure and reduce the work load of the heart. They also may prevent or reverse the hypertrophy of the heart and vessel walls. ACE inhibitors have been shown to increase the incidence of birth defects and are contraindicated during pregnancy. They also should be used with caution with other drugs that affect the kidneys like diuretics. Patients using insulin can experience low blood sugar. Increased monitoring is important with diabetics. Some over the counter pain medications, ibuprofen (Advil, Motrin), Naprosyn (Aleve) and similar compounds can make ACE inhibitors less effective. Acetaminophen (Tylenol) has no impact on ACE inhibitors (Sweitzer, 2003). ARBs have antihypertensive effects similar to angiotensin converting enzyme (ACE) inhibitors, but ARBs act to block the binding of angiotensin II to vascular smooth muscles, while ACE inhibitors prevent the formation of angiotensin II. Calcium channel blockers work by preventing calcium from entering cells of the heart and blood vessel walls. Blocking calcium affects the muscle cells in the arterial walls leading to relaxed and widened blood vessels. Grapefruit juice can increase the actions of these medications and should be avoided. People taking selective serotonin reuptake inhibitors (SSRIs) such as Citalopram (Celexa), Escitalopram (Lexapro), Fluoxetine (Prozac), Paroxetine (Paxil, Pexeva) and Sertraline (Zoloft), the most commonly prescribed antidepressants, did not seem to have an increased risk of high blood pressure. Those taking serotonin and norepinephrine reuptake inhibitors (SNRIs) which include Cymbalta, Effexor, Khedezla, Fetzima, and Pristiq had a slightly increased risk of stage 1 hypertension. But people taking tricyclic antidepressants such as amitriptyline (Elavil), desipramine (Norpramin), nortriptyline (Pamelor), and imipramine (Tofranil) were likely to see a rise in blood pressure. Like reuptake inhibitors, tricyclics seem to block the reabsorption of serotonin and epinephrine back into nerve cells after these chemicals are released into a synapse. Patients taking these antidepressants were 20% more likely to develop hypertension (Teply, 2016). Decongestants often contain pseudoephedrine or phenylephrine. Sudafed and Neo-Synephrine are common examples. Both these decongestants narrow blood vessels thus increasing blood pressure. Patients with hypertension should check with their physician before using these medications. The general recommendation for caffeine consumption is 200 milligrams a day – the equivalent of two 12 ounce cups of brewed coffee. Researchers from the Mayo Clinic (Alexander, et al., 2017) conducted a meta-analysis with data from 18 randomized controlled trials and 16 prospective cohort studies on the impact of Omega-3 fatty acids (EPA+DHA) on coronary heart disease risk. They found EPA+DHA from foods or supplements resulted in a statistically significant lowered risk, up to 18%, of a CHD event in patients who were in a higher risk population, particularly those with elevated triglyceride levels and elevated LDL cholesterol levels. Patients with seafood allergies need to consult with their physicians, as Omega-3 supplements are usually derived from fish products. Statins are important to the overall management of cardiovascular risk for many patients. They are relatively low cost, orally administered medications that effectively reduce plasma cholesterol. The most popular ones are atorvastatin (Lipitor), simvastatin (Zocor), and rosuvastatin (Crestor). The body has two sources of cholesterol, dietary and biosynthesis primarily in the liver. Statins inhibit the hepatic biosynthesis of cholesterol. Statins are similar in structure to a precursor molecule required for cholesterol synthesis. Statins competitively inhibit the enzymatic conversion of HMG-CoA by competing for reductase, an enzyme integral to the synthesis of cholesterol. Inhibiting biosynthesis reduces hepatic production and secretion of cholesterol. Hepatocytes can sense the decreased intracellular cholesterol caused by statins and respond by increasing the production and expression of low density lipoprotein receptors (LDL-R) on the hepatocyte plasma membrane. LDL-Rs bind to circulating low density lipoprotein cholesterol (LDL-C) and very low density lipoproteins (VLDL). Together the LDL-C and LDL-R are then transported into the hepatocyte. Inside the hepatocyte the LDL-R is separated from the LDL-C. The LDL-R is recycled and returned to the membrane while the LDL-C undergoes degradation to lipids, free fatty acids and proteins. In some cases, statins do not adequately reduce cholesterol levels and many patients cannot tolerate statins because of side effects such as muscle aches and pains, muscle damage, increased blood sugar, cognitive impairment and rarely liver injury (FDA, 2016). PCSK9 inhibitors are a new class of drugs that can dramatically reduce plasma levels of low density cholesterol (LDL-C), "Bad cholesterol". PCSK9 inhibitors are monoclonal antibodies (MABs) that are manufactured to bind to free proprotein convertase subtilisin Kexin 9 (PCSK9) in the plasma. Hepatocytes secrete PCSK9 to regulate expression of LDL-R. Circulating PCSK9 attaches to the LDL-R and LDL-C complex and is internalized with them in to the hepatocyte. When PCSK9 is bound to LDL-R the receptor cannot be recycled and it is degraded with the the LDL-C. PCSK9 inhibitors prevent the attachment of PCSK9 to the LDL-R thereby permitting recycling and increased LDL-R expression on the plasma membrane. PCSK9 inhibitors can be used alone or in combination with statins although research is ongoing to measure efficacy and side effects. The New England Journal of Medicine published several studies demonstrating the efficacy of evolocumab, bococizumab and alirocumab. Both drugs used separately with statins lowered cholesterol dramatically, sometimes as much as 60%. These are now niche drugs most commonly used in conjunction with statins to reduce cholesterol levels in patients who did not respond to statins alone. There are some disadvantages to PCSK9 Inhibitors. They are currently given twice a month by injection. They are more expensive, up to $7,000 to $9,000 a year. They are generally well tolerated but the side effects can include nasopharyngitis, itching, flu, injection site reactions, and serious allergic response (Curfman, 2015). Healthy lifestyle choices can significantly reduce the risk of developing HF. Healthy behaviors can also reduce the severity of some HF symptoms. The CDC guidelines for adult exercise includes 2 hours and 30 minutes (150 minutes) of moderate-intensity aerobic activity such as brisk walking every week. They also add this exercise can be done at 10 minute increments. Pal, Radavelli-Bagatini, and Ho (2013) reviewed original articles on the impact of exercise on blood pressure and vascular function. They found regular exercise of 30 minutes most days a week improved blood pressure levels. "slowly work up to at least 2.5 hours (150 minutes) of moderate-intensity aerobic physical activity (e.g., brisk walking) every week or 1 hour and 15 minutes (75 minutes) of vigorous intensity aerobic physical activity (e.g., jogging, running) or a combination of both every week (AHA, Healthy Living)." "at least 30 minutes most days of the week - can lower your blood pressure by 4 to 9 millimeters of mercury (mm Hg). It's important to be consistent because if you stop exercising, your blood pressure can rise again (Mayo Clinic Staff, 2016)." A recent study (Hirsch, 2016) showed 25% of Americans use some type of digital process to monitor health activities. Of the ones that are used 40% are wearables, used to track steps and/or heart rate. Information on bracelets and clip on monitors that measure steps and calorie output could also be included in exercise instructions. According to Riaz (2014) there is an established link between obesity and hypertension and LVH in various epidemiologic studies. As many as 50% of obese patients have hypertension. Patients should be encouraged to maintain their Body Mass Index (BMI), a calculation of height and weight, below 25 to reach a normal weight category. A BMI of over 25 is generally considered overweight. High sodium consumption (>2 grams/day, equivalent to 5 g salt/day) and insufficient potassium intake (less than 3.5 grams/day) contribute to high blood pressure and increase the risk of heart disease and stroke. The World Health Organization reports that most people consume too much salt (9 - 12 grams per day), or around twice the recommended maximum level of intake. Sodium is found naturally in a variety of foods, such as milk, meat and shellfish. It is often found in high amounts in processed foods such as breads, processed meat and snack foods, as well as in condiments (WHO, 2016). Increased potassium intake reduces systolic and diastolic blood pressure in adults. Potassium is commonly found in a variety of unrefined foods, especially fruits and vegetables (WHO, 2016). According to Appel (2006) black individuals are especially sensitive to the BP-lowering effects of reduced salt intake, increased potassium intake, and the Dash Diet. Appel (2006) and Klatsky (2011) found evidence that supports moderation of alcohol intake effective in lowering blood pressure. Alcohol consumption should be limited to <2 alcoholic drinks per day in most men and <1 alcoholic drink per day in women and lighter-weight persons. One alcoholic drink is defined as 12 oz. of regular beer, 5 oz. of wine (12% alcohol), and 1.5 oz. of 80-proof distilled spirits (Appel, 2006). Caffeine, most often consumed in coffee or tea, typically causes a short spike in blood pressure. Some studies have shown some regular, high consumers of coffee have higher blood pressure readings than those who are non-coffee drinkers. According to a recent systematic review and meta-analysis by Mesas, Leon-Munoz, Rodriquez-Artalejo and Lopez-Garcia (2011) the administration of 200-300 mg caffeine produced an average increase of 8.1 mm Hg in systolic blood pressure and 5.7 mm Hg in diastolic blood pressure. The effect lasts less than 3 hours. In habitual coffee consumption, no ongoing elevation of blood pressure was noticed nor was any evidence of a higher risk of CVD. It is difficult to establish a limit to how much caffeine is safe. Some new research has shown differences in reactions to caffeine because of genetics, particularly the amount of CYP1A2 enzymes. Some individuals are fast metabolizers of caffeine because of abundant amounts of liver enzymes that metabolizes caffeine. The effect of caffeine on their bodies is short lived. They can thus tolerate many cups of coffee. Slow metabolizers will feel the effects of coffee for up to 6 hours. The researchers recommend caution for individuals with uncontrolled hypertension since there is an immediate elevation of blood pressure which can increase their immediate risk of coronary disease and stroke. Some medications are known to inhibit the actions of CYP1A2, thus slowing down the metabolism of caffeine. Some of the studies showed CGA and other phenolic compounds, magnesium and trigonelline, found in coffee can reduce inflammation and endothelial dysfunction. When consumed in moderation, these beneficial effects may offset harmful effects of caffeine input. The general recommendation for caffeine consumption is 200 milligrams a day - the equivalent of two 12 ounce cups of brewed coffee. It is recommended individuals check their individual response to the caffeine in coffee by checking their blood pressure within 30 to 120 minutes of drinking coffee or other caffeinated beverage (Sheps, 2016). Which of the following have been shown to lower blood pressure? Smoking is reported by the U.S. Department of Health and Human Services (2015) to be a major cause of CVD and the cause of one of every three deaths from CVD. It increases the buildup of plaque in blood vessels and causes thickening and narrowing of blood vessels all of which contribute to hypertension (U.S. Department of Health and Human Services, 2010). Smoking cessation programs are generally classified as pharmacotherapies or behavioral therapies. FDA approved pharmacotherapies include: nicotine based medications; patches, gum, inhaler, lozenges and nasal spray and non-nicotine based medications such as bupropion and varenicline. Behavioral therapies include the use of a partner, counseling services, hypnosis, and professional advice from a physician or nurse. There are many reports of the efficacy of these programs. The smoker's motivation and age is a significant factor besides the method used in producing smoking cessation. Most reports show it takes multiple attempts due to relapse rates to produce permanent smoking cessation. One report showed hypnotherapy produced better efficacy than nicotine replacement therapies (NRT). The researchers reported 36% of hypnotherapy patients to be nonsmokers at 26 weeks compared with 18% of the NRT patients (Hasan, 2014). Alexander, D. D., Miller, P. E., Van Elswyk, M. E., Karatko, C. N. & Bylsma, L. C. (2017). Meta-Analysis of Randomized Controlled Trials and Prospective Cohort Studies of Eicosapentaenoic and Docosahexaenoic Long-Chain Omega-3 Fatty Acids and Coronary Heart Disease Risk. Mayo Clin Proc. 92(1), 15-29. Hasan et al. (2014). Hypnotherapy is more effective than nicotine replacement therapy for smoking cessation: results of a randomized controlled trial. Complement Ther Med. 22(1),1-8. Klatsky, A.L. (2015). Alcohol and cardiovascular diseases: where do we stand today? J Intern Med., 278(3), 238-50. Mayo Clinic Staff. (2016). Diuretics. Retrieved on August 7, 2016 from http://www.mayoclinic.org/diseases-conditions/high-blood-pressure/in-depth/diuretics/art-20048129. Pal, S., Radavelli-Bagatini, S. & Ho, S.(2013). Potential benefits of exercise on blood pressure and vascular function. J Am Soc Hypertens. 7(6), 494-506. Teply, R. M., Packard, K.A ., White, N.D., Hilleman, D.E. & DiNicolantonio, J. J. (2016). Treatment of Depression in Patients with Concomitant Cardiac Disease. Prog Cardiovasc Dis., 58(5),514-28. Wright, et al. (2015). A Randomized Trial of Intensive versus Standard Blood-Pressure Control. N Engl J Med., 373(22),2103-16. Management of Heart Failure. A Report of the American College of Cardiology Foundation/American Heart Association Task Force on Practice Guidelines. J Am Coll Cardiol., 62(16),1495-1539.